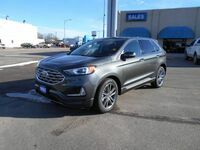 Ford has a talent for packing incredible value into the most compact packages, and in the 2019 Edge it sure shows. With this two-row model hosting a deceivingly spacious cabin and competitive engine lineup, even those browsing three-row crossovers are being drawn to the Edge. Does this compact competitor really have what it takes to challenge the market’s larger models? The answer is yes. 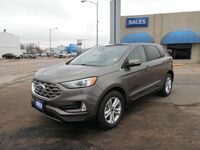 See how when the 2019 Ford Edge goes up against the 2019 Toyota Highlander in this comparison. Size differences aside, the Edge and the Highlander feature similarly handsome exterior designs. Both models are athletic in appearance without succumbing to the overbearing bulky flair found on many SUVs. Interior styling is the same story, with the two bringing similar options in terms of luxury and tech offerings. It's when we get to performance and efficiency that we start to see some contrast between the two models. 275 - 380 lb.-ft. Torque 184 - 263 lb.-ft. The Highlander kicks off its lineup with an unimpressive 185 horsepower and caps it off at 295 horsepower with its available V6. 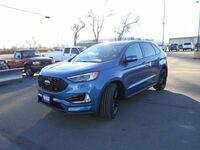 The Edge delivers more power all the way through, offering up to 250 horsepower on its standard engine and 225 horsepower on its own top-end V6. Another notable difference lies in drivetrain versatility. The Edge offers AWD as optional with its basic 2.0L engine and standard with the top-level V6. The Highlander does things differently, reserving AWD as a costly addition to the more expensive V6 engine only. The Highlander’s three-row layout makes it a better fit for families that demand more than five seats, but those just looking for some extra room should steer clear. Those extra seats mean less space for each passenger, as the Edge features noticeably more headroom and legroom in the rear. The Edge’s 39.2-cubic-foot cargo space also puts it ahead of the Highlander, which offers just 30.4 cubic feet.